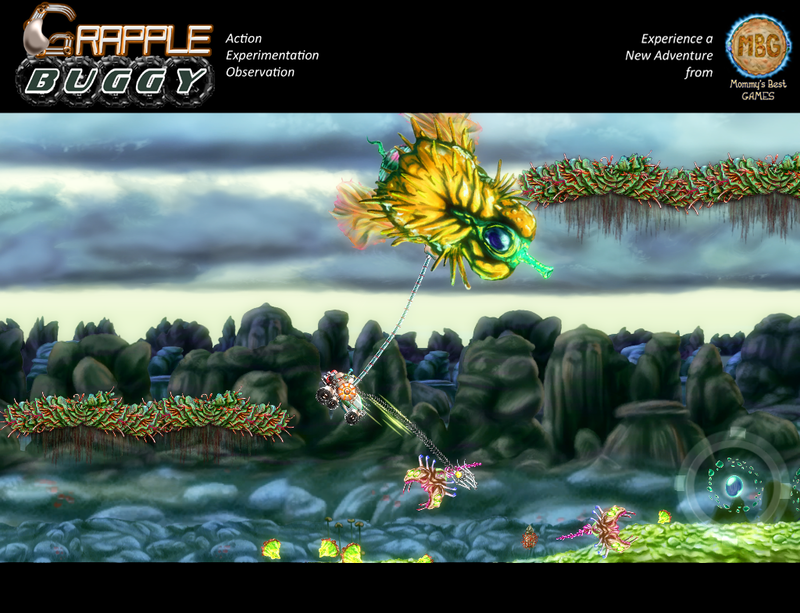 Grapple Buggy went to E3 2010 in a secretive capacity as opposed to the press-tastic event from last year. I privately showed a brand new demo to interested parties such as prospective publishers, and sup@r l33t pre$$ such as you'll see later. 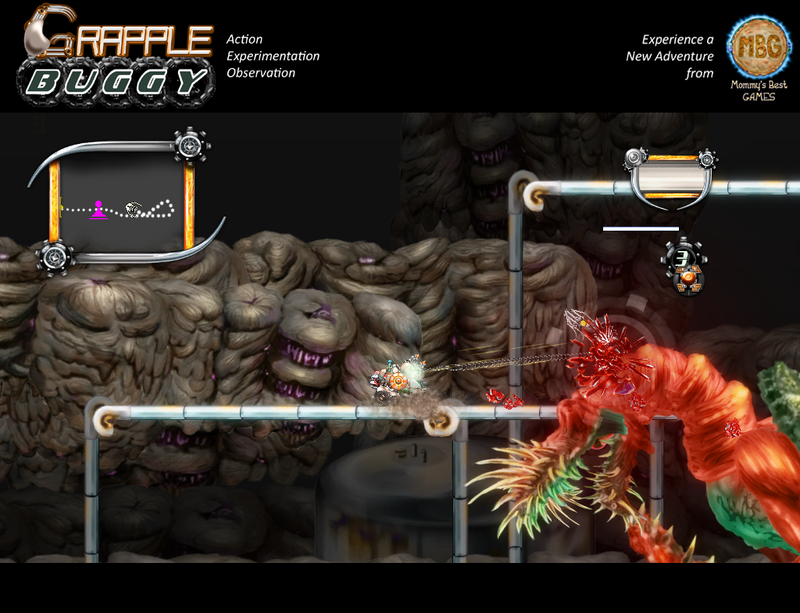 Click for a full screen view of the new, fancy-pants widescreen display! The demo has shaped up a lot since having entered it into Creators Club playtest last year, and everyone at the show were very excited to play the entire game. I showed the game to Inkling Games owners, Lesley and Peter (colleagues from Insomniac Games), and they had some great advice for further improving things: Enemies like the Trail Fly should attack in a more recognizable pattern, no matter how obvious some of the gameplay seems, always teach each new chunk to the player before combining situations, and in our game's particular case subtitles are hugely important! When you get too "close to the canvas" sometimes it helps to hear good gameplay concepts repeated by friends. Grapple Buggy's new cinematics feature full dialog (which has been cleaned up and processed to sound more like the characters are actually in a vehicle), camera work, and some animation, but because they aren't full animated people subtitles help give it that extra polish and oomph to get the point across. Currently I'm getting further improving the E3 demo to eventually send off to the various publishers with whom I met at the show. They all showed great interest, so I feel good about sending the game to them. It's one thing to stand next to them while they play but a whole other level of polish and good design is needed to hand an mid-development game off to someone to play on their own. And thus I'm taking any issues that came up at E3 and trying to iron them out. "The titular buggy is sleek and polished, piloted by a sarcastic blonde and the vehicle’s disembodied brain. The contrast the far-future look of your craft against the truly alien environment and creatures is successful and gives the game a special appeal." Just popping a zit for him. I pulled those HUD elements directly from screenshots (thus the errant graphics around them). I definitely didn't hate them, but the map in particular was too simple looking, and primarily the theme just didn't seem to perfectly fit the game in particular. I was difficult to decide to change it but things got a boost when an intern, Justin Kaffenberger, started working on a redo of the map programming. We worked on a new, more organic design for the map layout which then required new graphics for the map and mini-map. Once the internals of the map started changing, and looking better, I felt inspired to change the main HUD. I found additional direction playing God of War. Its HUD was in the theme of the game, it wasn't tied to "what Kratos may be seeing". And thus, they have lots of chains, and rocks, and swords and such. I liked that idea and decided to frame all the art with high-res versions of the grappling arms, claws, and gears. The map itself and all menus are now framed by large metal claws, with gears rotating on the sides. The actual map reflects the game goals and landscape. Instead of strict "Metroidvania" style cells in a matrix, in which you are supposed to visit each one, now the areas are organic blobs. As you visit an area, those areas are present on your map. Your path is shown by a pulsating trail. 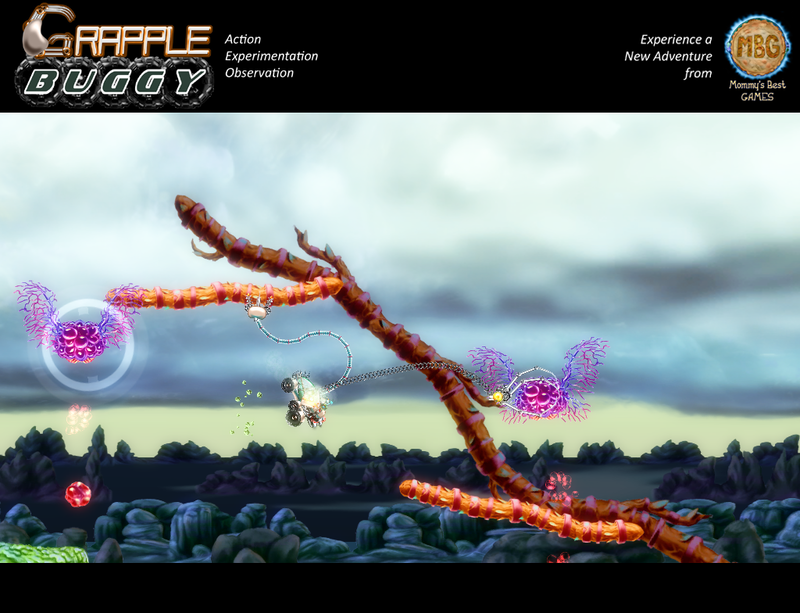 There will likely be less backtracking in Grapple Buggy than in Metroid-style games, and it's still simple enough figuring out where to go next. 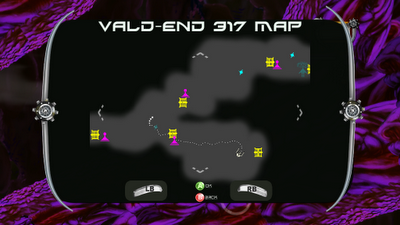 Sprites for save points, level transitions, and powerups are floating on top of the map area shapes. The graphics may still undergo some change, but so far I like the crisp new look and feel good about finally finding a strong direction for the HUD design.